When visiting with pediatric doctors and specialists, moms and dads frequently voice concern that their child rarely eats food with fiber. In my practice, I frequently hear from parents that they find it extremely difficult to get their carb-friendly toddler to eat different types of foods with good fiber content such as fruits, vegetables, almonds and whole grains. So why is fiber so important to include in your child’s diet? It can lower blood cholesterol, prevent diabetes and help move food through your child’s digestive system — promoting healthy bowel function and protecting against constipation. First off, fiber is not digested by the body. It passes through your stomach, intestines, colon and then out of your body. Dietary fiber, often called roughage, is the indigestible plant-derived food component. This now includes certain non-starch polysaccharides –– large-sized carbohydrates that aren’t digested, but some of which are fermented once they reach the large intestine. They also contain resistant starch, which are resistant to digestion. 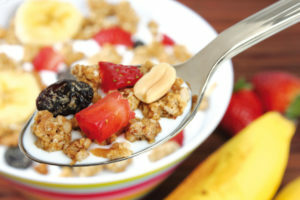 There are two types of dietary fiber: soluble fiber –– found mainly in fruits and vegetables –– and insoluble fiber, which is found mainly in cereals and whole grains. Soluble dietary fibers easily dissolve in water and form a gel-like substance when water is added to it. This helps soften stool in the body. Insoluble fibers do not dissolve in water, but they can trap water to increase stool bulk and ease defecation. How does dietary fiber work? Dietary fiber works in three ways: It increases stool bulk, adds thickness to the stool and forms physiologically active products by fermentation. Most bulk-forming fibers are insoluble, such as cellulose and hemicellulose, but there are some that also can be soluble, like psyllium. They absorb water, add to stool weight and facilitate regular bowel movements and are hardly fermented. Viscous-forming fibers thicken in the lumen of bowel when mixing with water. They can help reduce absorption of fats like cholesterol and slow down absorption of sugars. Examples of this type of fiber include guar gum, pectin and methylcellulose. Most of these fibers are fermented by the gut flora. Fermentable fiber is used by the normal gut flora in the large intestine to form short chain fatty acids, while also adding some bulk to the stool. The short chain fatty acids provide energy to the cell lining of the large bowel and may have anti-cancer and anti-inflammatory properties. In realistic terms, it may not always be easy to achieve these fiber intake goals. However, by adding fiber-rich foods to your child’s diet, you can easily help ramp up your child’s fiber intake. The above requirements are estimates, and I recommend parents seek the help of a pediatrician or pediatric dietitian or if they have additional concerns. As a parent myself, I understand that making fiber fun — and tasty — for kids is the tough part of the equation. To help fight this battle, I recommend parents try various kinds of food with good fiber content and add soluble fibers into drinks, making it less noticeable. When introducing more fiber into your child’s diet, it’s important to note that the fiber content should be gradually increased to avoid gas and bloating. Fun ways to sneak fiber into your child’s diet include blending fruits into smoothies, pureeing vegetables into pasta sauces, choosing new whole-grain cereals and opting for whole-grain bread when making their favorite sandwich. Some great snack ideas are apples (skin on!) with peanut butter, veggie kabobs, fruit salad and air-popped popcorn. Try to switch up the menu periodically to keep your child interested, and don’t be afraid to get creative. Trying to make sure your child is getting enough fiber doesn’t have to be a chore.